Tomorrow morning a very lovely lady writer friend of mine and I are off to Melbourne for the week. We’re heading down to attend various sessions at the Melbourne Writers’ Festival, and because we both love to be in that city. The picture above is one I took when I went down for a visit last December. 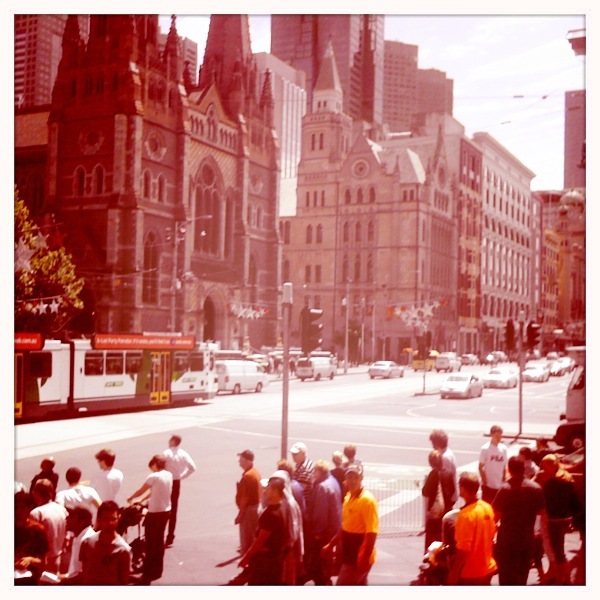 I took it because I so often stood in that spot when I lived in Melbourne, watching the trams cross the intersection at the corner of Flinders and Swanston Streets, waiting to meet one friend or another. “Meet you under the clocks at Flinders Street,” we’d say. I’m fully expecting this trip to be full of nostalgia and whimsy. Our eight days there will be the most time I’ve spent in the city since I left it three and a half years ago.